Phil and Teds is a fast-growing juvenile products company based in Wellington, New Zealand. They are most famous for their in-line double strollers, which uses a second seat attachment. It was founded by a father and son team in 1994 and was later purchased by Campbell Gower who became CEO of the company in 1998. 2 Why should I choose a Phil and Teds product? The popularity of the Phil and Teds line grew and so did the company, expanding today into more than 40 countries with major markets throughout Europe, the UK, North America, Australia and New Zealand. Phil and Teds makes not only their unique in-line strollers (or buggies as they’re also called) but high chairs, car seats, infant carriers, bassinets and travel cots as well. Why should I choose a Phil and Teds product? Phil and Teds aspires “to be the number one brand of choice for parents, allowing them to continue to lead a dynamic and active lifestyle, with kids in tow”. This is very appealing to parents with active lifestyles. And active parents want to make sure their precious children are safe while out on the latest adventure. Phil and Teds tests their products extensively and exceeds the safety standards of all the countries they do business with worldwide. The inline models have lots of accessories to add to your and your baby’s comfort and convenience, such as a travel cot/bassinet called The Cocoon, the Peanut bassinet, cup and bottle holders, seat liners, pannier bags (side bags for added cargo space) and hang bags. A child riding in the main seat has a weight limit up to 44 pounds and the child in the double attachment accessory can weigh up to 33 pounds. If you keep this as a single stroller, your child may ride in it up to 55 pounds. Learn more about the adapters, which one to buy with which stroller and the configurations by clicking or tapping here. 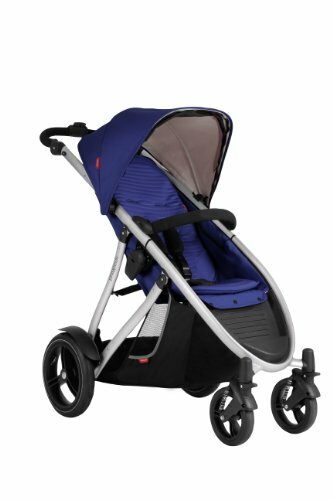 Phil and Teds has a couple of compact 4-wheel strollers and six in-line tandems available in a variety of attractive color schemes. Revolutionary stand fold with 2 seats on. Phil & Teds has made innovation their par for the course, and they did it again with the new Voyager. This convertible stroller has a 4-in-1 adaptable seat, both in front and for the second seat that you can buy as a doubles kit. The seat either sits up in “regular mode” or lies bassinet flat for your newborn. It also parent-faces or can be removed in bassinet mode as a free-standing unit. Use both seats as bassinets at the same time, and you have an ideal stroller for twins. 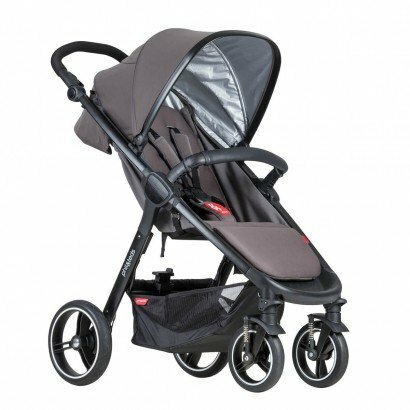 Other features in the Voyager include a folding system that enables you to fold it with both seats attached, facing in either direction, or in bassinet mode. 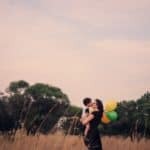 For you new parents on the scene, this was literally impossible not that long ago! 12″ New Zealand designed aeromaxx tires provides a smooth ride with puncture-proof peace of mind. The sun canopies have zip-away panels for maximum coverage. This is a brand new stroller on the market for 2016, and not many reviews are out yet. But parents will love the 24″ seatback, allowing lots of growth room, it’s the tallest seat back on the market right now. See this demo video by Phil and Teds to see how each feature works. Compact with a slim design, the Sport is a snappy addition to the Phil and Teds line. 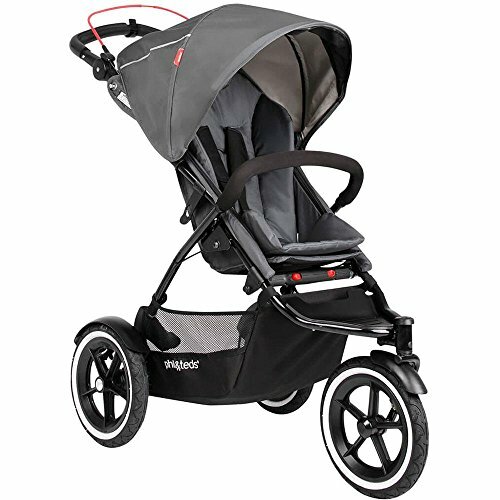 In single mode, the Navigator holds your child up to age five or 44 pounds.The stroller weighs 28 pounds in singles mode and the 23-inch overall width provides easier maneuvering while shopping. A doubles kit turns the single into a double with eight seating configurations used with the optional carry cot or your car seat. Baby faces you or the world! The seat is nice and roomy with soft matted premium fabric, and the recline goes all the way back to flat. A new shoulder strap adjustment system eliminates dangling ends and a fabric-covered padded bumper bar comes on and off easily. A pivoting sun canopy has a flip-out visor to shield any angle of the sun and it has a peek-a-boo window. 12-inch air-filled tires are easily removed for better storage and Phil and Teds have improved the steering for excellent handling. 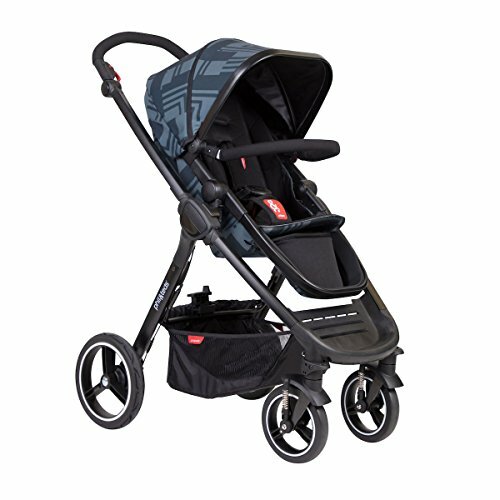 Quickly fold the Sport one-handed and an auto frame lock holds your stroller together once folded for easy storage. An ergonomic, height adjustable handle provides additional comfort. The Smart Buggy has been redesigned for 2016, losing the roundness of the chassis and making it more sturdy. This version has an easy-flip hand brake and 10-inch puncture-proof rear tires with suspension for a smooth ride. The narrow width at just over 22 inches makes it a “smart” option for those of you navigating and living in tighter, more compact spaces. The stroller weighs 23 pounds, so it is still considered a full-size product, even though it is quite compact for its size. It will hold your child up to 44 pounds. The fold has been perfected – an intuitive one-step standing fold. Parents also appreciate the height adjustable handle and the storage basket that can hold up to 22 pounds of stuff. I’ve never heard of a basket holding that much before; hello grocery shopping! 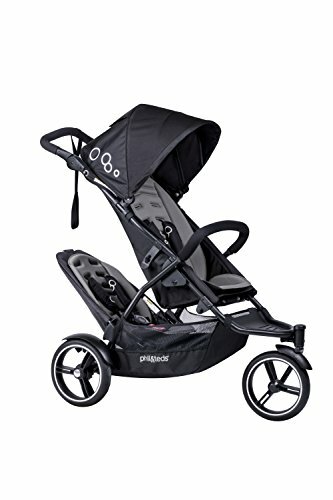 The Phil and Teds Smart Buggy has three options for your newborn: car seat as part of a travel system accommodating brands such as Cybex, Graco, Maxi Cosi and Chicco; a carry cot facing you; and lastly facing forward right onto the nearly flat recline. An extending sun canopy comes down nearly to the bumper bar, blocking almost 99% of the harmful UV rays. I like the large peek-a-boo window! Your child has an adjustable 5-point safety harness with a redesigned buckle and an adjustable leg rest to support little legs and stretch out during nap time. A bumper bar gives them something to hang on to. Take a look at the demo video that shows you all the features in action. 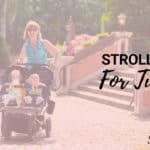 Similar to the Smart, the Smart Lux is the stroller to have if you want a 4-wheeler, yet you don’t need something that converts to a double, and you also want more features than the Smart offers. Smart Lux is a bigger stroller; it weighs three pounds more than the Smart at just over 26 pounds. So while it is not light weight, it is compact with a flat fold for convenient storage. The wheels are a big deal – they are overall 2 inches larger than the Smart. The 10″ front wheels have suspension and are EVA. Twelve-inch rear wheels are air filled so it is like you are gliding along. Cobblestones and rough surfaces are a breeze with wheels like these! The seat reclines into three positions, including flat, and has an adjustable footrest. Baby can either face you or face the world with the reversing seat. Turn the seat into a cozy bassinet for your newborn or install the Smart Lux Bassinet. 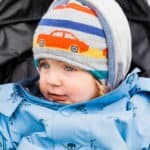 If you prefer to put your car seat right on the frame, adapters are available for most major brands and you will have a stylish travel system. Consumer Reports weighs in on the SmartLux giving it an overall good score with very good marks across the board for Maneuverability, Ease of Use and Safety. They particularly like the sturdy feel it has while pushing it and the easy-access basket. However, they do say it is large and bulky and has some counter-intuitive features. 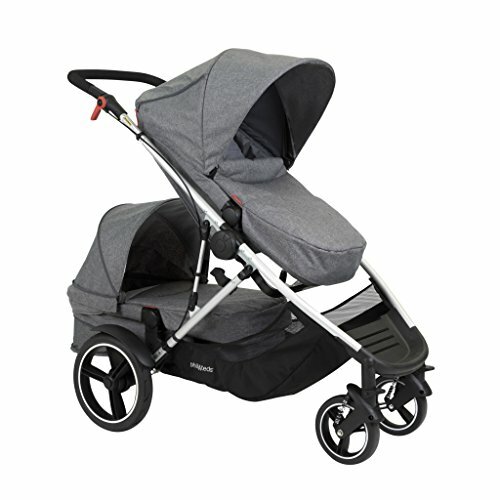 Named Dot for its small size, this Phil and Teds stroller is designed to be 15% smaller than the Explorer. While the Navigator weighs 28 pounds, the Dot is less, at 24 pounds. Many of Dot’s features are the same as Navigator’s, such as the 44 pound weight limit as a single and 77 pounds in doubles mode. The Dot also has the same main seat size, height adjustable ergonomic handle, changeable seat liner with premium fabric, “tailfree” shoulder harness system and fully reclining ventilated seat. The fold is ultra-compact and can be done one-handed and a auto-frame locking clip holds the stroller together. Wheels pop right off with no need for any tools. Here are a few differences between the Dot and the Navigator. The Dot has 10-inch pneumatic air-filled tires that provides a cushioned, smooth ride. The sun canopy is huge, with a flip-out visor and peek-a-boo window. The canopy does not pivot like the Navigator, though. While the Navigator has face-to-face compatibility with eight seating configurations, the Dot has seven, which still provides plenty of options from newborn through preschool years. So far, reviews are fantastic for the Dot with consistently high ratings for the space-saving size and high quality. Parents remark that the buckle is complex enough to undo that her 3 year old cannot escape. That’s always good news. Let your eyes take in the beauty of these two stunning strollers. They absolutely gorgeous! The Verve won a prestigious design award in 2015 called the Red Dot Award. 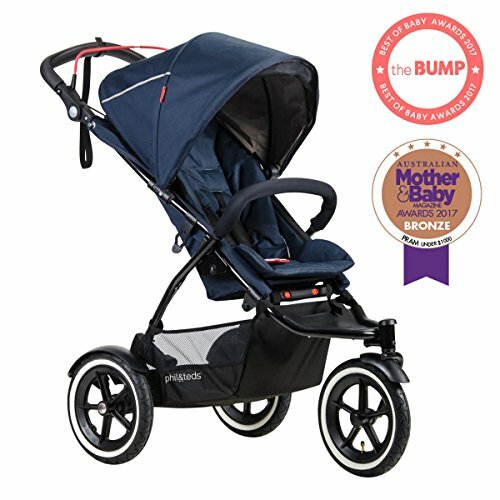 Both Verve and Vibe are the same strollers, except that the Verve has two 7″ front wheels. Everything else on these strollers are exactly the same, such as suspension coils for a ride as smooth as butter. Both are convertible strollers, taking a second rumble seat in the back which reclines. They each have 23 different seating options from newborn through toddler, for twins or siblings of different ages. The main seat is made of high-end lycra material and holds up to 44 pounds. The tall seatback gives plenty of growing room and reclines in four positions. Both products weigh 28 pounds but have an ultra- compact, free-standing fold. I like that the stroller folds even with the doubles kit! Here is a really cool and unique feature: Using the doubles kit seat as a parent-facing option. Install the second seat facing you so your baby has some important bonding time. The only downfall to this setup is that there is no sun canopy in this position. 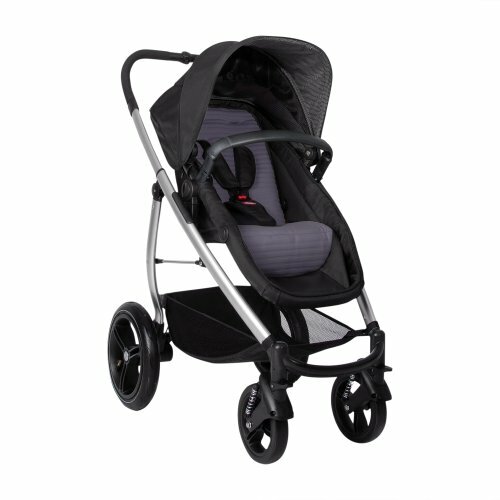 Parents, you enjoy an adjustable height handle bar and when in singles mode, the basket is large and roomy. See this informative video about both the Verve and Vibe Phil and Teds stroller. One of the most luxurious in the Phil and Teds line is the premium Promenade. 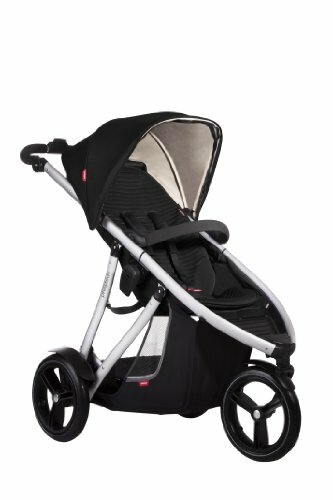 This is a sophisticated convertible stroller with a doubles option meant for city use. The seat on the Promenade morphs into a flat-bed bassinet and sits higher on the frame as baby faces you for better bonding. Once you have two children or have twins, add the second seating option, whether you use the bassinet, car seat, or any number of variations. However you use the Promenade, what makes it spectacular is that you can use it for children up to 4 years old. 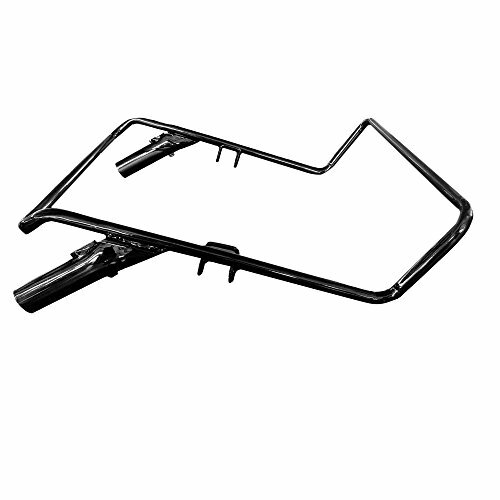 Other features that savvy moms and dads appreciate are the telescoping handle bar that extends way out and the large sun canopy with zippered extension panel for extra sun coverage. The maneuverability is incredible – one dad turned it all the way around in a small elevator in NYC! The fold and smooth gliding wheels also get raves in early blog reviews. Take a look at this demo video to give you a good idea about this cool Phil and Teds stroller.